CLAIRE HINTON led the way for Spa Striders at Sunday’s Stratford Half Marathon. She clocked a time of one hour, 33 minutes and 30 seconds and was followed by Andy Roach (1:36:40), Sue Cox (1:40:17), Ben Cohen (1:43:16), Iain Mcarthur with a new PB (1:46:18), Julie Walsh (1:49:03), Emma Bish (1:51:26), Lucy Marcovitch with a new PB (1:51:49), Kevin Baskerville (1:53:17), Bethan Gwynn (1:54:13), Lucy Tugwell (1:55:03), Philip Wood (2:01:59), Ves Hill (2:04:54), Helen Pugh (2:13:23) and Julie Grimmett completing her first half marathon (2:21:56). 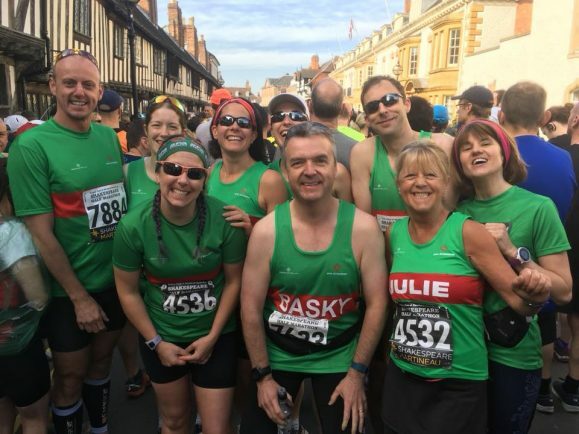 Last Wednesday was the Silverstone 10km and offered the Striders their first race of the summer series. Ian Allen led the men home (36:34) followed by Chris McKeown (36:45), Ste Taylor (37:44), Simon Parsons (39:10), Andrew Bonjour (39:22) running his longest run since October due to injury, Chris Wilson (41:16), Robert Egan (41:30, PB), Graham Donoghue (42:51), Hartwig Busch (43:43), Dave Lindsay (44:21), Doug Rattray (44:27), Sean Warren (44:38), Matt Leydon (45:50), Ben Cohen ran an incredible seven-minute PB (46:12), Billy Morton (48:19), James Warren (48:54), Dave Lithgow (50:59), John Wilson (52:18), Kevin Pantling (54:20), Gary Perkins (57:15) and Brian Warren (58:31). Claire Hinton ran an excellent race (41:26), followed by Carolyn Wilkinson (43:06), Dawn Clark (44:14), Fiona Edwards (46:18), Mairi Walker (46:25), Clare Bryan (47:26), Amanda Wiggins (48:32) with a new PB, Louise Dwyer (48:50), Lorraine Parsons (50:49), Claire Westrope (51:12) and Abi Morton (1:02:15). Elsewhere, Claire Murphy ran the Maverick Dorset Long Course 23km trail race, finishing in 2:04:57.